What can YOU do to promote positive messages and employment outcomes for people with disabilities? Use the Campaign for Disability Employment’s (CDE) tools and products, and join our important dialogue about the value of disability inclusion in the workplace! The CDE is a positive outreach campaign aimed at increasing the employment rate of people with disabilities. It sends a clear message: People with disabilities want to work, and their talents and abilities benefit America’s businesses. By implementing inclusive workplace practices, such as maintaining a flexible and disability-friendly work environment, employers can capitalize on the talents of qualified people with disabilities. The first step is recognizing the value they add to the workforce and fostering a workplace culture that is welcoming of everyone. Interested in joining our movement and spreading the CDE’s message? Here are seven things you can do, right now. Get Social. The CDE has an active presence on Facebook, Twitter, Instagram, LinkedIn and other platforms. Please follow us on social media, share and like our posts, and encourage your networks to do the same. Subscribe to the CDE. The best way to stay up to date on CDE news, products and events is to subscribe to our e-alerts. 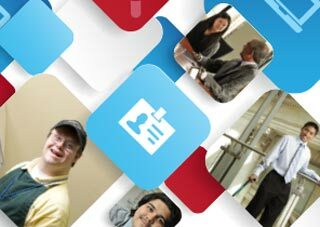 Published periodically, they’re full of news and information designed to help you engage and help us shape positive attitudes about the employment of people with disabilities. Play and Distribute Our PSAs. The CDE’s flagship media products are our four television PSAs, and they can never be aired too often. So tell your local TV station managers that you and fellow viewers want them played on their networks. (We have a sample letter to help you do so.) The PSAs can also be embedded on websites and shared via social media, so please spread the word. It’s time to go viral! Download and Use CDE Resources. There’s much more to the CDE than our PSAs. Check out our PSA toolkits which feature free posters, web banners, print ads, ready-to-publish articles and discussion guides designed to help you lead discussions about our video PSAs. Engage in Our Dialogues. Changing negative attitudes about disability and employment means fostering important dialogues about workforce diversity and inclusion. In that spirit, the CDE engages in a number of interactive conversation-starters, from guest blogs to Twitter chats to photo-sharing campaigns. Subscribe to our newsletter to learn all about these opportunities to join the conversation. Become a CDE Supporter. Organizations willing to proactively engage in CDE outreach are considered “Supporters” of the campaign and are listed on our website. Supporter-level activities include posting a link to the CDE on your website, distributing PSAs, hosting screening events, distributing CDE fact sheets at conferences, posting a “Proud Supporter” badge, and more. If your organization takes steps to adopt the CAN-Do spirit and promote our campaign, please let us know so we can thank you! Foster Disability Inclusion. Of course, the most important way to advance our movement is to “just do it.” Take steps now to support the hiring, retention and promotion of employees with disabilities. Visit our Where to Learn More section for links to valuable tools and resources designed for various audiences. If you’re an employer, explore ways to foster a disability-inclusive workplace culture and start capitalizing on employment practices that will benefit everyone. If you’re a person with a disability, aim high and show the world what you CAN do when given the opportunity. If you’re a family member or educator, or another person in a position to influence the career aspirations of youth with disabilities, work hard to instill in them an early love of learning and cultivate high expectations related to work and community participation. See our “Because” PSA campaign to learn more. Download and print this helpful backgrounder on our campaign. Access the tools you need to help us change attitudes about disability and employment. Subscribe to our updates, follow us on social media and learn how to spread the word. This website and the Campaign for Disability Employment are funded under contract DOL-OPS-1605DC-17-D-0005 from the Office of Disability Employment Policy / U.S. Department of Labor.